Certainly Winnie the Pooh does. So in honor of the release of Christopher Robin here is one of my favorite recipes involving honey! If you think of Brussels sprouts as simply a bland mini-cabbage, you haven’t tried it this way. As with most recipes, I found a similar one online and then changed it to suit our family. It has since become a favorite of ours and made with simple ingredients. The key is the honey and balsamic reduction which brings such a bright and complex flavor to the whole dish. 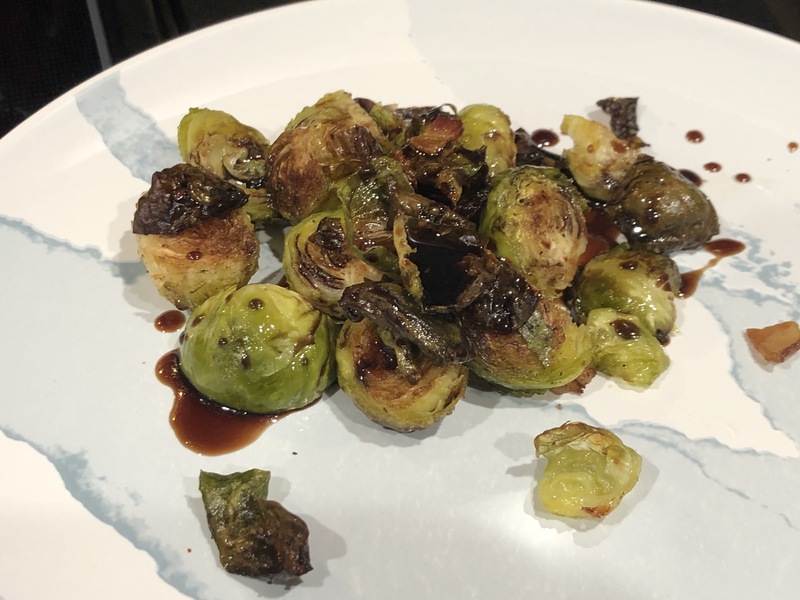 The roasted Brussels sprouts and the flavor of the bacon bring the savory aspect to the veggies, while the reduction brings both sweet and a slightly sour punch. So good. Cover a baking sheet in heavy duty aluminum foil. Spread the Brussels sprouts across the sheet with the cut side face up. Drizzle the olive oil over it and shake salt and pepper briskly over it all (the salt and pepper will be absorbed into the sprouts). If using garlic this is where you would put it on the sheet. Mix them all together with your hands until all the sprouts are liberally covered then turn them face down so the cut side is against the foil (which will make it roast better). Spread the bacon around all over. I cut them with a pair of scissors for efficiency doing all three at a time. Thick-cut works better as it takes longer to crisp up which works in the needed cooking time. Once the oven is heated to 425 degrees, place baking sheet inside. While that is cooking, put the balsamic vinegar and honey into a small pot and heat until it begins to reduce. You don’t want it to get too thick before removing it from the heat as it will continue to thicken. Ideally, you want it to be liquid enough to drizzle over your veggies while being well combined. It probably takes about 10 minutes depending on how hot your stove top is. Once during the cooking, after the cut side is nicely browned, I flip all the sprouts and continue cooking until finished. “Finished” means well-browned with the fallen leaves crispy and the bacon bits nice and crispy. Serve onto a plate and then drizzle with the reduction. Enjoy! It’s good enough for Winnie the Pooh.